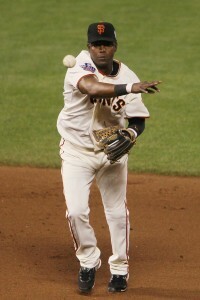 It was Game 2 of the World Series between the Texas Rangers and San Francisco Giants. The Giants easily took Game 1 and looked to sweep on its home field before heading back to Texas. The game was pretty tight the whole way, tied at 0-0, until Edgar Renteria hit a homerun in the 5th inning to give the Giants a 1-0 lead. Then they extended the gap to 2-0 off a solid hit by Juan Uribe. So it was 2-0 at the end of the 7th, and the Rangers still thought one good offensive inning would get them right back in this thing. That’s true, except they weren’t the ones who had the batting explosion, that was San Fran in the 8th inning. This team is so hot right now, they strung together 7 more runs in the 8th inning to take a commanding and condescending lead over the Rangers. The shut-out wins gives them a 2-0 advantage headed back to Texas. Wow, this is a high-scoring World Series. San Francisco 9, Texas 0. In the NBA, it was time for this year’s #1 draft pick, John Wall, to make his NBA debut. Wall has had a terrific pre-season, and the Washington Wizards are hoping Wall can lead them to the playoffs. The Wizards made a number of key off-season acquisitions, including Kirk Hinrich (for point-guard help) and Yi Jianlian (for help down low), and they think they can play spoiler in the East. Their opponent, the Orlando Magic, happens to be one of the best teams in the league, and they certainly proved it last night. John Wall had a decent night, finishing with 14 points and 9 assists, but the Magic cruised behind outstanding all-around play from Dwight Howard (23 points) and Vince Carter (18 points). The Magic look to be contenders, and showed that Miami isn’t the only Florida team to watch out for. Orland 112, Washington 83. And in the second game of the night, the Phoenix Suns traveled to Utah to take on the Jazz. The Jazz looked horrible against the Nuggets on opening night. Heading into the season, the Jazz were predicted to finish second in the West, primarily because they have a great all-around team, and just added underrated big man Al Jefferson. They don’t seem to have too much energy out there, and just couldn’t get it going against the Suns. Phoenix, on the other hand, jelled quite well. They look like they’re picking up where they left off last season, except with more experience, chemistry, and added newcomers Hedo Turkoglu and Josh Childress — two guys who will definitely produce for them this season. Phoenix 110, Utah 94.